Trying to plan and execute a fishing trip regardless of length when you have very small child can be like trying to arrange a small military operation, FACT! So on the weekend when I noticed that the tides were right, the weather was right and the time of year was right, and after a quick phone call to the Tackle Box (where I was informed the fish have been coming so close you could catch them in a bucket) I mentioned over a cup of tea “I may go and try and catch some mackerel tonight…”. This went down rather well; as we both like mackerel. I grabbed my spinning bag, checked I had some feathers, visited the shed for my rods and packed the car. I pottered around the house for a while and made sure all my bits were done and ZIP! Before you know it I was popping along the B3165 towards Lyme Regis and thinking about the evening ahead. Parking in Lyme costs an absolute fortune, I really like the place, but the cost of parking for more than a few hours is honestly off putting. I would only be fishing for 3 hours (until it got dark). I arrived at the Beach in (the Cobb car park), cried a bit when I paid for parking and heading down to beach next to the Cobb. I have seen big mullet come in to these weed beds on quiet days, but today the tide was still too far out. Lyme bay is surprisingly shallow along this area. I walked up on to the Cobb and could see the bottom quite clearly. Big rafts of weed and rock ledges. There were huge shoals of fish surfacing but these were hundreds of yards out. Well beyond casting range. I saw an angler walking up off the rocks at the end of the Cobb and down the walkway. 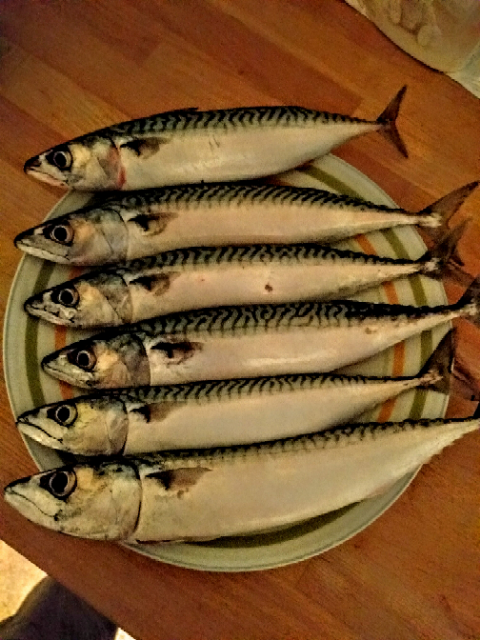 “Any mackerel?” I asked. “Yeh!” he said, “I had mine around 250 – 200 yards”. I only had a spinning rod with me, and despite my best efforts I would never be able to achieve a cast further than 60/65 yards. To be completely honest I was very sceptical the a cast of that distance could be achieved with his gear either, but that is neither here nor there. I walked to the end of the Cobb and knew I wasn’t going to get any fish from here. I looked down the beach and saw a group of people standing along the wall and beach near the harbour with fishing rods. This is where I was heading! I arrived to the small bay and saw fishing rising everything. I could of easily been confused with a coarse fishing lake. The fish were jumping, splashing and diving all over the place. I could also see a number of people returning fish to the water. I spoke to him “Why are you keeping Scad?”…. “Conger bait mate…” and he carried on hauling them in. Hopping up on to the rocks I slung out my string of feathers and slowly wound in. WHAM! First take WHAM! Second take. 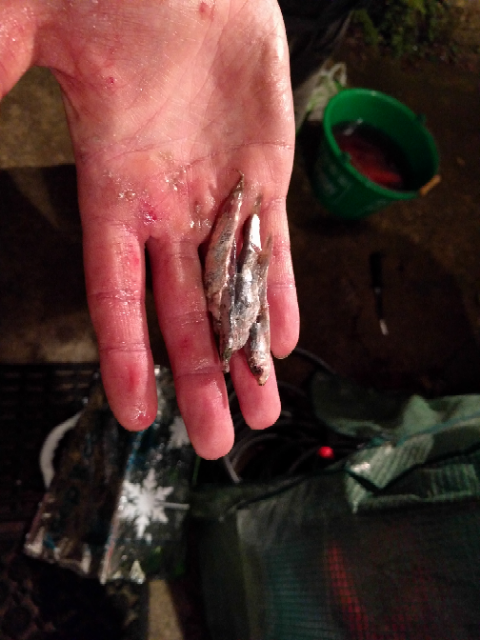 I wound in and had a double Scad hook up. 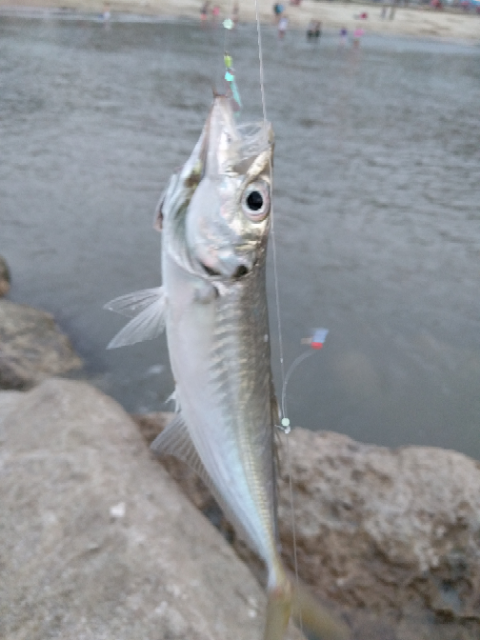 This was followed by several more Scad and the smallest joey Mackerel I’ve seen for a long, long time. Although this was fun, there were so many anglers concentrating on catching fish in this days before long crossed lines happened, and I started looking for a quieter place to cast. It was the evening of the Lyme Regis Light Parade and I watched what looked like hundreds of people walking through Lyme with their lanterns, I took a few pictures and knocked it on the head. I had caught well over 40 mackerel with the majority going back in. I kept 6 good sized fish and headed back to the car. The tide had come in and I had been cut off! Fan-flipping-tastic. I had no idea how far the water had come in, how deep it was, or what I would be walking on. Several irrational fears filled my head and I almost started to panic. “I’m going to have to wade”. I stepped out into the dark abyss! Wet foot and Sand! It was about 5 inches deep, but it was so dark I couldn’t see the bottom. What an absolute plonker! I laughed out loud and walked the 20 feet of water to the visible part of the beach and squelched off to the car. This is what the fish had been chasing! See my previous visit write up about this venue here.